I was thrilled to get a reader request for this week’s film Back to the Future (DVD/Download) because it’s one of those obvious classics that I have a tendency to overlook on Cinema Sips. It’s such a part of everybody’s shared film experience, and I’m excited to think about it from a cocktail aficionado’s standpoint. As Lorraine says, “Everybody who’s anybody drinks.” Whether it’s 1955, 1985, or 2017, alcohol is always cool. I wish I could say the same for Pepsi. Watching Michael J. Fox travel back in time to when his parents were teenagers always gets me thinking- would I have been friends with my parents in high school? Would I have been considered cool in 1967? I like to think that my penchant for bold prints and Beatles records would have tipped the scales in my favor, but who knows? I certainly wouldn’t have had the magnetic personality of Michael J. Fox, who is charming as hell in any decade. Teaching his nerdy dad how to woo his mom and fend off school bully Biff (ahem, sorry, President Biff) is no easy feat, but Fox pulls it off and still manages to get to the clock tower in time for the DeLorean to be struck by lightning. This movie is so Hollywood. Build drink over ice, stirring gently to combine. Word of advice, don’t be like George and live it up with some chocolate milk. Be like Lorraine, the closet bad girl/future alcoholic who knows how to have a good time. We’re only young once. Unless of course, your name is Marty McFly. For him, time and age are all relative. Cheers! *Yes, that’s right, I own this movie on LaserDisc and still have a functioning LaserDisc player. How’s that for going back in time?? Posted in Action/Adventure/Heist, Sci Fi and tagged Amaretto, Back in Time, Back to the Future, Crispin Glover, DeLorean, Huey Lewis, laserdisc, Lea Thompson, Michael J. Fox, movie cocktails, Pepsi, Power of Love. Bookmark the permalink. I’m just going to say it- Donald Trump stole his hair from Barf. If you’re like me and searching desperately for a fun Halloween costume, this wisecracking Mog might be your best option. Half man, half dog- he’s his own best friend. Trump wigs are easy to procure these days, and the allusion to this cult classic Star Wars parody will make you the coolest trick-or-treater on the block. I’ve never been a big Star Wars fan, but I am a huge Mel Brooks fan. His mastery of the art of puns is unparalleled, and Spaceballs (DVD/Download) is no exception. A robot named Dot Matrix? “Combing” the desert?? Pizza the Hut??? Genius. The plot rambles and the acting is deliciously campy, but that script is just magic. And with all the pop culture references, I feel like I’m watching a 2 hour joke crafted for entertainment geeks like me. And with 80’s comedy greats like Joan Rivers, Rick Moranis, and John Candy populating the cast, it’s hard not to have a good time watching this. Although this is a cocktail blog, I have to make an exception this week. Lone Starr is just too good a name to slip by. While watching Spaceballs, I recommend drinking the favorite beer of cheap Texans: Lone Star. Mel Brooks is one of those comedy greats whose work will still be relevant and funny long after he’s gone. I love that he is still working on projects, even in his 90’s! I know I’ve said in the past that I despise sequels, but even I would love to see Spaceballs 2: The Search for More Money. May the Schwartz be with you, Mr. Brooks. Cheers! Posted in Comedies, Sci Fi and tagged Barf, Donald Trump, Dot Matrix, Halloween costume, Joan Rivers, John Candy, Lone Star Beer, Mel Brooks, Pizza the Hut, Rick Moranis, Spaceballs, Spaceballs 2, Star Wars parody. Bookmark the permalink. I am well aware that Cinema Sips is severely lacking in the sci-fi genre, but this is largely because so few good ones get made. Robots, hovercrafts, bad makeup- ugh. However this week, I’m excited to watch a futuristic film that is one of my long time favorites. Gattaca (DVD/Download) features rockets, gadgets, and gene selection, yet somehow manages to remain an intelligent, thought-provoking drama. Finally- sci-fi I can get behind! In addition to beautiful art deco-meets-postmodernist sets, lead actors Ethan Hawke, Jude Law, and a vacant Uma Thurman round out the eye candy quota. It’s actually no coincidence that this film stars two ridiculously good looking men. Hawke’s character Vincent buys the identity of Jude Law’s character Jerome, in an effort to qualify as a genetically superior candidate for the space program. This entitles him to blood, urine, skin samples, hair samples, and endless pithy quips from a drunken, wheelchair bound Law. In essence, it’s the inVALid with the INvalid, in a hot Odd Couple-esque pairing. In Gattaca, Hawke and Law are like vodka and gin. They look the same, but beneath the surface are wildly different. Therefore my cocktail this week combines these two spirits, with a dash of Lillet thrown in to balance it out (the Thurman of the drink, if you will). While watching Gattaca, I recommend drinking a Vesper. Shake vodka, gin, and Lillet over ice until well chilled. Strain into a martini glass, and garnish with a lemon twist. While the Vesper is more well-known for being the drink of James Bond, I think this classic cocktail is equally at home in Gattaca. While certain parts are very futuristic, there are many stylistic elements which make the viewer feel transported to the Golden Age of Hollywood cinema. Is Gattaca a sci-fi film masquerading as chic poetic drama? Or the other way around? Either way, it’s even better with a cocktail. Cheers! Posted in Dramas, Sci Fi and tagged Ethan Hawke, Gattaca, gene selection, Jude Law, movie cocktails, Uma Thurman, Vesper cocktail. Bookmark the permalink. In an effort to prove that I actually do pay attention to reader requests, I am going out of my comfort zone this week by featuring a sci-fi movie. I’ve actually had several people ask me what they should drink while watching this week’s film Serenity (DVD/Download), and rather than roll my eyes yet again at the reminder that writer/director Joss Whedon is beloved by just about everyone but me, I decided to accept the challenge. I figured, I loved his version of Much Ado About Nothing, and I love lead actor Nathan Fillion (Mr. Fillion- you will always be the very best Joey Buchanan on One Life to Live in my book!) so how terrible could this be? Well, I’m sad to say that I just didn’t get this movie. I gave it a chance- honest, I did. But between the explosions, spaceship chases, campy acting, and bouncing back and forth among various conflicts, I struggled to keep focus on the plot. Perhaps I would have enjoyed this more if I’d seen the TV show that pre-dated the film, Firefly. 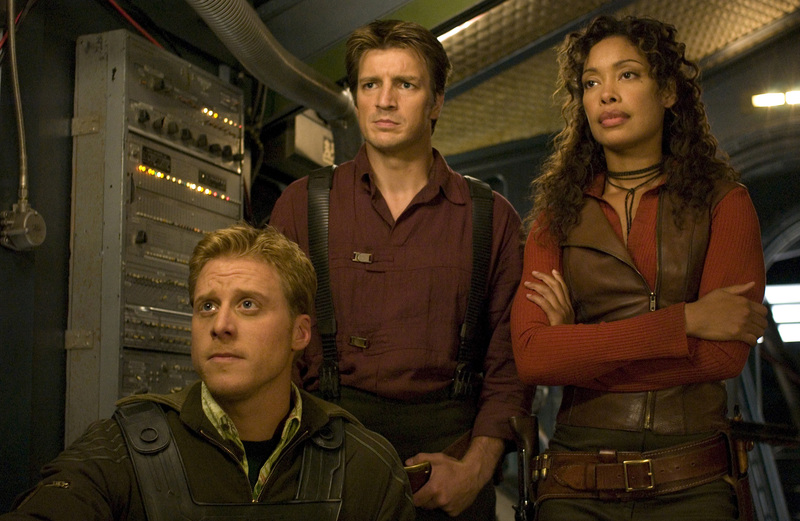 As it was, I felt like I was thrust into the middle of a story, and it was just assumed that I would like and root for all of these characters, simply because they were created by Joss Whedon. If you’re into sci-fi, and/or you like westerns, you’ll probably love this movie. So please don’t let my romantic comedy-poisoned brain stop you from checking it out. Speaking of Firefly, how fortuitous that this cult-favorite TV show happens to share a name with a vodka brand! In homage to Capt. Malcolm’s southern/western/cowboy/bizarre accent, I’m using their sweet-tea flavored vodka in this drink. And as a side note, I am pretty excited to FINALLY have a use for my cactus drink stirrers, which can really only be used with a western (or sci-fi/western in this case). While watching Serenity, I recommend drinking a Seren-e-Tea-Ni. Combine ingredients in a cocktail shaker over ice. Shake until chilled, then strain into a chilled martini glass. Garnish with a twist of lemon. Was watching Serenity a waste of two hours for me? No, of course not. First of all, nothing Nathan Fillion-related is a waste of time for me. Second, watching River Tam’s martial arts moves was actually pretty enjoyable, like a deadly ballet. Third, I can now listen to my friends talk about this movie and actually follow what they’re saying. There are a lot of Joss Whedon fans out there, and for them I’m so glad that there’s a movie that inspires such loyal devotion. I’m not one of them, but that’s okay. I don’t have to be. All I have to do is come up with a drink that makes the viewing experience even better for us all. Challenge accepted, and mission accomplished. Cheers! 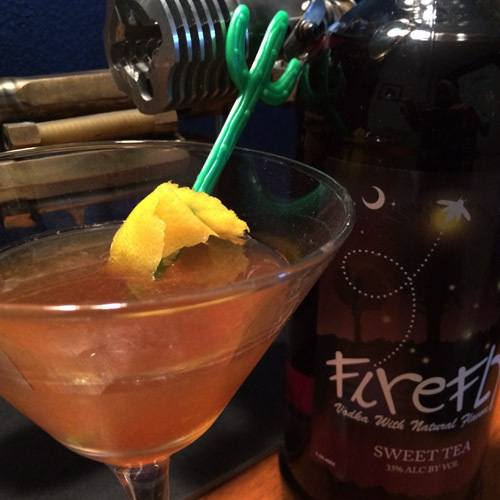 Posted in Sci Fi and tagged Firefly, Firefly Vodka, Joss Whedon, Nathan Fillion, River Tam, Serenity movie, Sweat Tea Martini. Bookmark the permalink.